BE projects: ECE final year engineering projects, (With ready 100 pages of final report) ~ Engineering projects ideas for final year students & paper presentations collection blog. Departement: Communication engineering, electronics engineering. 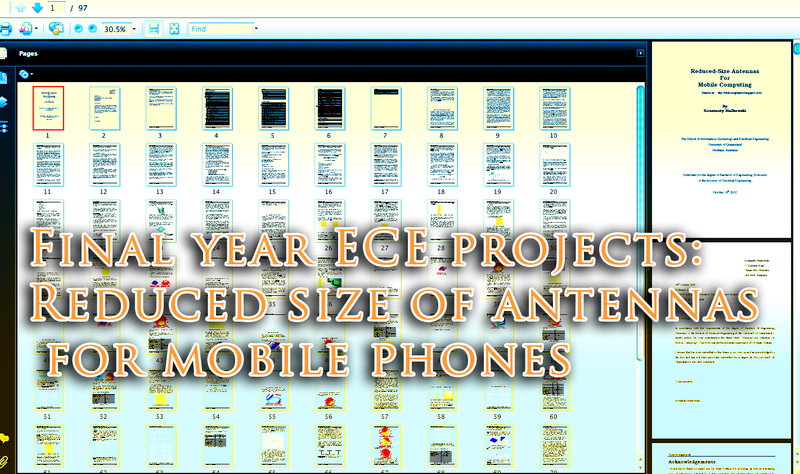 Can be used for: Final year ece projects, engineering projects for communication engineering students. This project on antenna technology is a good choice for all the electronics and communication engineering students. Antenna is one of the most basic component of every communication unit. This antenna play a very important role in proper communication field. Though an antenna is just a piece of metal that is used to transmit the signals into the air, the work it does is phenomenal. In early days the size of the antenna was never an issue, all the users were ready to allot a space of the aerial either over the terrace or the open balcony. But these days the size plays a big role due to the new compact communication devices (Mobile phones). The smaller the device is the better market is has. So the technology has to meet the needs. Thus the researches were started to develop the smaller antennas for the mobile computing devices. This engineering project is easy to implement and also has a ready made Project report of about 100 pages attached at the bottom. Sample from the antenna designing project: frequencies requires a free-of obstacles space between a transmitter and a receiver. In practice, such line-of-sight conditions for a mobile environment occur only over very short distances (in the order of 1 meter). This explains why IR devices are mostly used in indoor environments. In addition, laser communication over several kilometres can also be accomplished. However, similarly, as IR, this requires free of obstacles pathway between a transmitter and a receiver and a very subtle alignment of the two being at stationary positions. In order to achieve a non-line of sight communication, a lower range of electromagnetic spectrum, namely radio frequencies can be used. An application of a particular radio frequency band depends on specifications of the communication range and the bandwidth of the information-carrying signal. Lower range of radio frequencies is able to cover larger distances. However, this is at the expense of a narrower bandwidth for the signal carrying the message. This is viewed as a disadvantage. Other shortcomings of low RF frequencies are associated with the size of antennas, which are required to launch a radio signal from an RF circuit into a free space. In order for a traditional antenna (such as a dipole antenna) to function efficiently, its size needs to be about half free-space wavelength. As at the frequency of 1GHz, the free space half-wavelength corresponds to 15cm, it becomes apparent that microwaves and millimetre-waves, utilizing the frequency spectrum above 1GHz (with free space wavelength smaller than 30cm), can offer a reduction in size of radiating elements. The same frequencies can also offer substantial bandwidth for the information-carrying signal. For example, if it is assumed that a radio transducer operates over a 10% bandwidth, a 100MHz.